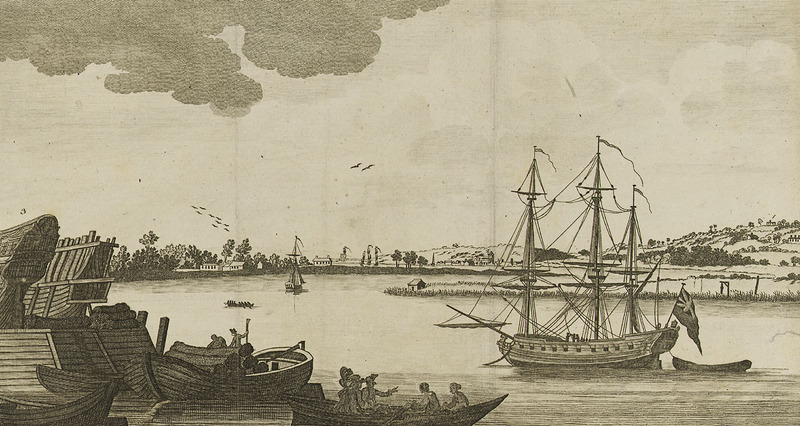 "A Perspective view of the River Thames," artist unknown, 1782, National Maritime Museum. Taken from the Kings Arms at Blackwall; Shooters Hill, Woolwich; The East India Dock Yard. From London Magazine Mar 1782. 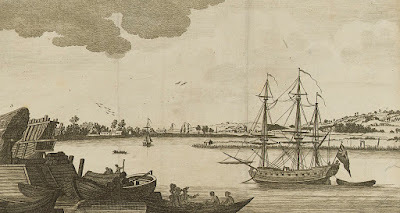 To the far left of the gram are a pair of East Indiamen on the stocks under construction. Afloat to the right of the frame is a twenty gun ship that might be either a small Royal Navy sixth rate or an East Indiaman. 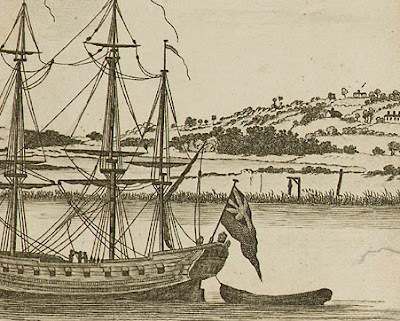 Her ensign at the stern might suggest a Royal Navy vessel, as it is not the colors of the East India Company, but depictions of East India Company ships in the eighteenth century certainly did fly other colors. This image is largely unremarkable and much like all other "Perspective Views." There is one detail that sets it apart. To the stern of our twenty gun ship we can see a malefactor gibbeted for display. Doubtless hanged at Execution Dock, this hapless criminal is displayed as a warning to others. 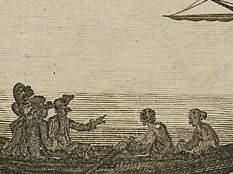 The sailors in this image seem to take little mind of the rotting corpse. These two are busy at the shipyard. It is difficult to say much about them, except that the standing sailor (or waterman) wears a round hat turned up front and back, and what appears to be a jacket. 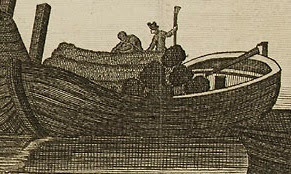 Two oarsmen in shirtsleeves and hatless row a well dressed couple away from the yard. Their coxswain wears an oddly shaped hat that might be a cocked hat reversed. He wears a jacket and single breasted waistcoat. Very cool. This blog continues to maintain its Treasure Trove status!